Private tutoring in Korea without a permit is illegal. The teacher could be fined up to 5 million won and/or up to 1 year imprisonment. Getting a permit for “kongbubang” is easy and it does not cost anything! 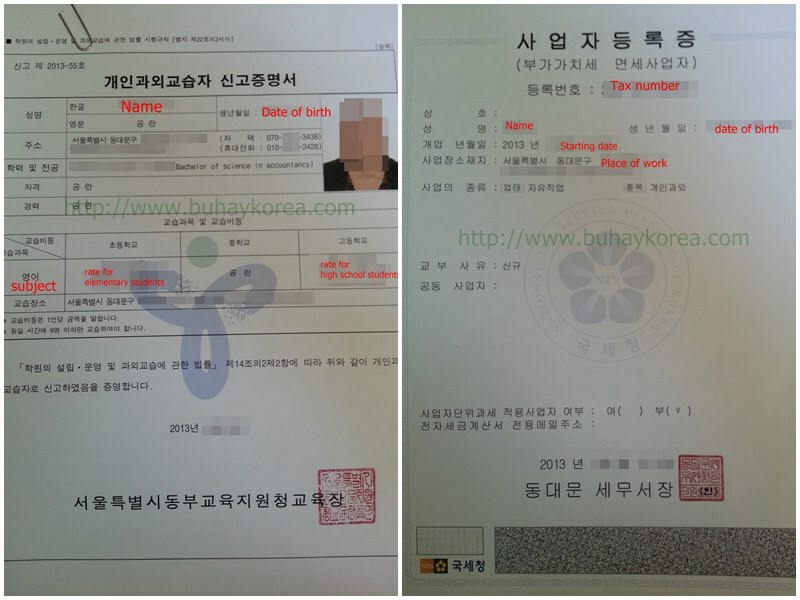 Who can apply for a private tutoring permit (officially called ê°œì¸ê³¼ì™¸êµìŠµìž)? – Go to the Education Office (êµìœ¡ì²­) in your district. – Look for the í‰ìƒêµìœ¡ê±´ê°•ê³¼ division. – The officer should give you the application form to fill in. – Hand your documents to the officer to be encoded in the computer. – The officer will tell you to wait for three~five days to receive the certificate. – There is no fee for the application. – After you receive the certificate, go to the TAX OFFICE nearest you. – Here, you will register your private tutoring and get a tax identification number. – At the Dongdaemun Tax Office, I just handed over my documents (the Private Tutoring Certificate and my ID) to the officer. He encoded the information and asked me when I would start my “business”. – A few minutes later I was handed the registration certificate. – I was at the tax office for less than ten minutes! Now that you’re ready to start your legal private tutoring, you could now advertise your business. ~ Post an advertisement in your apartment’s bulletin board. Make sure to get a permission from the Apartment Management Office. ~ Wait outside the elementary/middle/high school and hand flyers. ~ Ask your Korean mom friends for reference. ~ You are only allowed to teach a maximum of nine students in one class. ~ You can only teach the levels you applied for. If not, then apply for a revision at the Education Division. ~ You must provide receipts to your students (or their moms). Failure to do so could mean a fine of up to 3 million won. ~ You don’t need a permit to teach relatives or disabled people. ~ You are only allowed to have classes until ten o’clock in the evening. This is really useful info, thanks! I guess if I can’t find a full time job when I move to Korea this would be a great alternative. Ms. Betchay can i ask for some clarifications? “Diploma and transcript of records, notarized by the Philippine Embassy in Korea and the Korean Embassy in the Philippines (if you finished school in the Philippines)” . . . does this mean that it shoud be BOTH because you put AND? thanks! Hi Julia! When I applied for mine, I had my transcript notarized by the Philippine Embassy and it was okay with the Dongdaemun Education District. However, when I registered at another district they asked for a notarization by the Korean Embassy in the Philippines. To be sure, it’s better to have your papers notarized by both. Pwede po ba ang F3? Hi Kisha! Kasi nakalagay yung specific visa types na binibigyan ng permit for private tutoring, pero walang mawawala kung magtatanong. Minsan kasi iba-iba interpretasyon kagaya na lang nung requirement na nabanggit ko, pwede sa isa na notarized lang ng Philippine Embassy pero sa isa kailangan pati Korean Embassy naka-notarized. hi ms. betchay! im already here in korea na po. 3 months pa lang po ako dito. im currently working in an academy almost a month na po. my boss already told me about these requirements. i have them, however, they’re not notarized in korean embassy nor in the philippine embassy. although my boss told me that he’s gonna find a way i’d still wanna hear from u po. do i need to ask my relatives to send my documents to the korean embassy? thanks po. It only takes three days and they can ask the Embassy to send the document to your relative’s residence so they won’t have to go back again to pick it up.